Cyclamen are pretty decorative perennials, adding a burst of colour into your garden from late summer and into winter. With colourful up-swept flowers and green patterned leaves, this Latinia® series of cyclamen have been specifically chosen for their vigour and high health and their superior flowering performance. Cyclamen prefer shaded, cool and an airy position. They can be planted indoors or in the garden from late summer through in to winter. 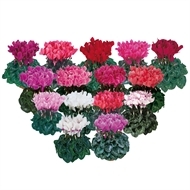 Cyclamen must have a well-drained growing medium and do not like to be dried out.